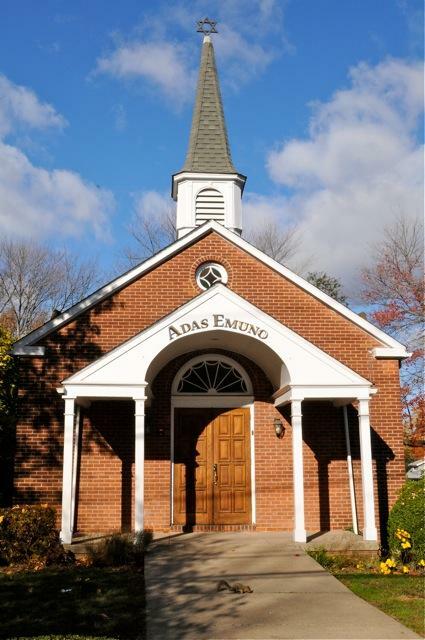 Congregation Adas Emuno is one of the first synagogues to be organized in the State of New Jersey, founded on October 22, 1871. Our founding principles centered on a spiritual partnership offering an inexhaustible endowment of hope, courage, and inspiration in concert with a love of family life and a practicing faith in universal brotherhood. 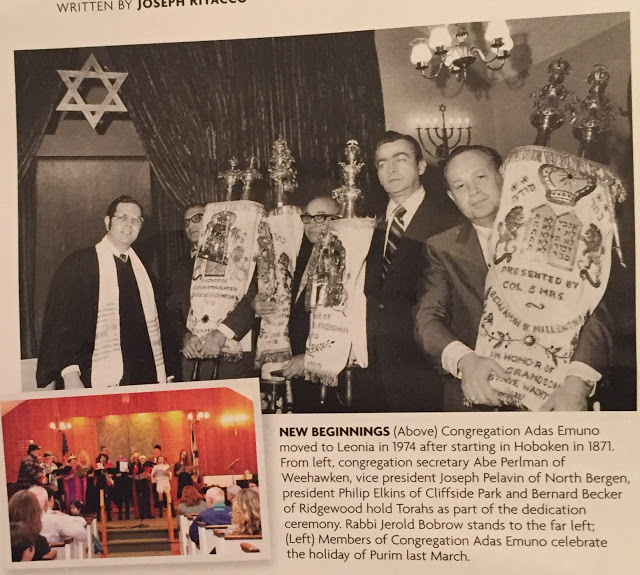 Phil Elkins, a distinguished past president who was instrumental in moving the synagogue from Hoboken to Leonia, always referred to the synagogue as having a “warm familial feeling,” and that feeling has been the unbroken thread woven from the early years in Hoboken to the present day in Leonia. Through a century and a half of abiding faith in Reform Judaism in America, the traditions of this glorious congregation have played an important part in the spiritual life of the community it serves. In its pioneering days, there were few, if any, Jewish settlers in Hoboken. However, by 1871, there were enough German Jewish immigrants in the city and its surrounding areas to hold a meeting in the Odd Fellows Hall (then at 2nd and Washington Streets in Hoboken) led by Louis Ettinger, Rino Berel, and Max Konert. This meeting marked the beginning of Congregation Adas Emuno. The first rabbi was the Rev. Solomon Schindler who later went on to lead a prosperous congregation in Boston, Massachusetts. The group continued to meet in the Odd Fellows Hall until April of 1874 when it moved to a larger and more ample building in town where it remained for nine more years. 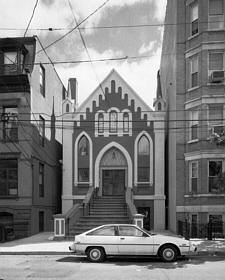 During this time, some members of the congregation began arguing that we need our own building, and in 1883 a synagogue for Congregation Adas Emuno was built on a parcel of land donated by the Stevens Family. This charming Gothic Revival building still stands today as an historic landmark, and at the time of its construction, was the pride of its congregation and a “credit to the city" of Hoboken [source: Hoboken Evening News, 1893]. At the synagogue dedication on April 15, 1883, the congregation consisted of 33 members. By 1893 it had grown to 100 members, all from the best-known and most influential families of Hoboken. There was also a well-attended Sunday school, a choir composed of the daughters of members, and a very active Hebrew Ladies’ Aid Society to help relieve the suffering of the poor. Temple brotherhood and sisterhood groups were added in the early 1900s with the organization of the Junior Brotherhood in 1931 and the Spiritual Advisory Committee in 1933. In 1919, membership dues were $30.00 per year, but by 1924 that fee had been raised to $45.00 per year with an additional charge for seats for the High Holy Days (ranging from $5.00 to $15.00 per seat depending on the relationship of the seat to the bimah). 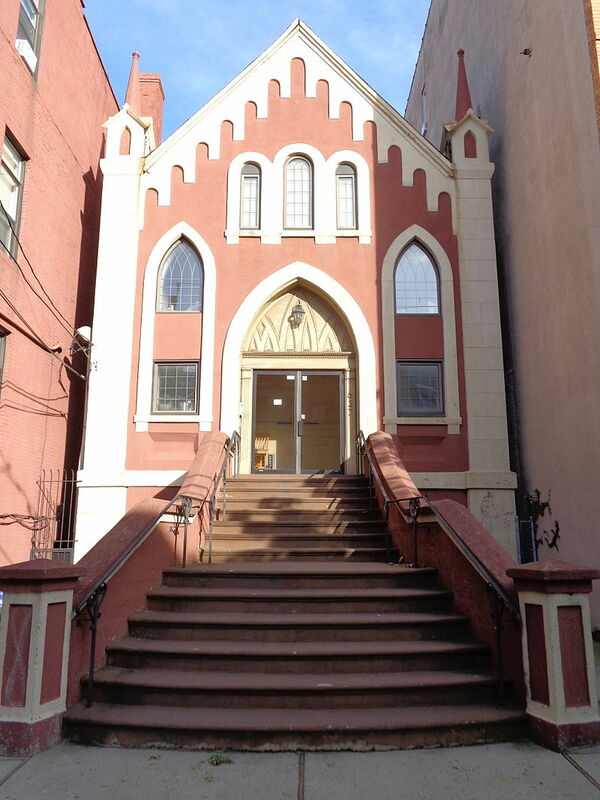 The synagogue moved to Leonia, its current home, in 1974. Converted from a Protestant church, the synagogue building has the distinctive and unusual feature of a steeple with a Jewish Star on the top. Adjacent to the synagogue building on High Street, which houses the congregation's Sanctuary and Social Hall, is our Religious School building, and there is a lovely garden situated between the school building and the clergy residence next door. Phil Elkins, who spearheaded the move from Hudson to Bergen County, served as President of Congregation Adas Emuno for over 20 years! More recently, we have been blessed by a series of outstanding leaders, including Dr. Vincent Bonagura, Virginia Gitter, Beth Ziff, Dr. Louis Steinberg, Dr. Alan Spector, Dr. Lance Strate, and current president, Michael Fishbein. Over the past century and a half, while larger synagogues have come and gone, Adas Emuno has survived and thrived by following the philosophy that small is beautiful, emphasizing sustainability and balance, and creating an open, participatory environment that puts people first, allows for creative expression, intellectual inquiry, spiritual growth, and a feeling of friendship, fellowship, family, and fun. While maintaining a four millennia long tradition, we welcome innovation, for example, having a Cantor, Kerith Shapiro, as our spiritual leader, from 2006 to 2011. Our Rabbi, Barry L. Schwartz, became the spiritual leader of our congregation in the summer of 2011, adding a dynamic new presence to our services and activities. Three years later we introduced a new concept of a Cantor-Educator, combining the roles of clergy and Religious School Director, as Cantor Sandy Horowitz, joined Rabbi Schwartz on the bimah. From its founding in 1871 to the present day, Congregation Adas Emuno has survived and thrived by providing its members a warm and welcoming environment for the pursuit of spirituality, schooling, and social action. We are a friendly, intimate, and inclusive community that offers many opportunities for participation in Jewish religious and cultural activities. Congregation Adas Emuno is a progressive synagogue that keeps faith with the 4,000-year-old history of the Jewish people, approaches Judaism as a tradition that is continually evolving, and is committed to a future devoted to education, ethics, the enlargement of human freedom, caring for our environment, a commitment to tikkun olam, and faith in our religious heritage as the foundation for each individual's search for meaning, for connection to something greater than ourselves, and for an experience of communion and transcendence. Come join us for the festivities!